The arrival of Georgia Aquarium's dolphins and its new dolphin show, AT&T Dolphin Tales (I love clever names! ), was highly anticipated. I've been to see the show three times since its opening in April. Although visitors may not make photos or video of the show (for the safety of the dolphins and the performers, not to mention the comfort of other attendees), there is a fantastic observation tank (video) just as you enter or depart the Dolphin Tales auditorium. I recommend arriving early so you can see some of the dolphins prior to the show, but look for the tank...I totally missed it the first time I went. If you wait until the show is finished, there will be lots of other people trying to get a peek. Of the 11 dolphins living at Georgia Aquarium, the show uses only 7-8 dolphins at a time (numbers told me by a docent). And viewers see at most five at a time (a very impressive five at a time!). The show is magnificent. It's theatrical, it's high-action, it's filled with special lighting and water effects, there are lots of dolphin tricks, you get to participate in a sing-along, and the trainers look like they're having the time of their lives. The show is in two parts. Whether that's on purpose, I do not know. The first time I saw the show, I was about to stand up and leave because the (theatrical portion) show was obviously over. The "second half" is all dolphin tricks and interaction between the dolphins and trainers (my favorite part). If you do arrive early, you'll get to see a video that tells about the construction of the exhibition (absolutely fascinating), as well as the selection of the lucky few dolphin trainers (they must have the best job in the world...they're definitely major enthusiasts). 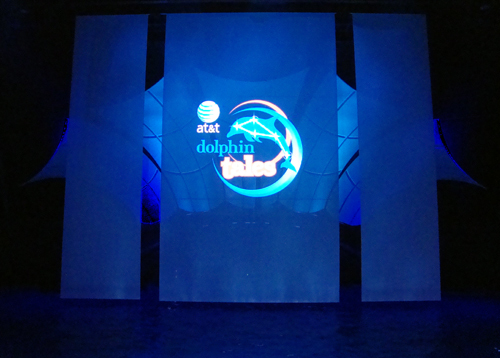 The AT&T Dolphin Tales logo (the logo shown during the show) resonates with me in a special way. The stars inside the dolphin represent the constellation Delphinus (Latin for dolphin), which lies near the constellation Aquarius (I'm Aquarius and a space enthusiast). The only other space connection I can think of at the moment is the world-famous Douglas Adams' "So Long, and Thanks for All the Fish" (from The Hitchhiker's Guide to the Galaxy...a most brilliant literary series!). It would not at all be a reach to say that this show has something for everyone. The first half is great for kids, the second half is highly entertaining for others...and I would venture to say that everyone loves dolphins.